This is from an unpublished piece I wrote back in 2005. ….So the extraordinary facility of his early years, the 15 notes per second on Saxophone Colossus that Greg Burk cited in the LA Weekly last week…well, that was what young brains can come up with. Young brains, young fingers, young lungs…. And the later stuff, the intricacies of The Bridge…well, that was the result of thousands of hours of contemplative, strenuous wood shedding, blowing into the wind, over the blasts of steamships and the cacophony of New York traffic. And even later, as the sixties wore on and Sonny’s tone became more voice like, the Bach complexities replaced by runs that sounded like him talking, as if three little words that emanated from the bell of his horn were even truer than the words that came with his speech…well, that is the result of a lot of struggle, a lot of searching, of endlessly questioning everything as you do it…. I think that finally, perhaps, he got to some point where he felt his seeking was over. All that Eastern religion, the stumping around India after wisdom, late nights thinking, blowing, thinking some more….it had all come to a result. A place. I wonder if you can hear it on East Broadway Rundown. That’s a ferocious twenty minute title track…beginning with a wild head of almost Tijuana Brass simplicity but at a hurricane tempo, Elvin Jones and Jimmy Garrison, fresh off the Trane, work up a savage rhythm, the bass pulsing, throbbing, Elvin locked in a monster polyrhythmic groove, and Freddie Hubbard and Sonny blat, howl and finally, shriek, and then push it on even further to these unearthly staccato squeals that swirl around Elvin and Garrison like the seagulls that used to scream and kite around Sonny out there on the Williamsburg Bridge. At last their cries fade and we are left with a moment of silence. Then Sonny speaks, talking through his horn. I don’t know what he is saying. Perhaps he is talking with the gods, or Buddha, or some inner self, or to the Muse itself. But it is there, a sentence or two of words that come out of his horn. It is as if he has reached some stage, some state, a place that Trane never got to through all of his screaming. That Ornette never even tried to get to because he didn’t believe in it. That Bird never even knew existed. If it did. Or does. But it did for Sonny. Or so it seems to me. There, in that studio, just shy of the twenty minute mark, Sonny reached Nirvana. Or Olympus. Then again maybe not. The mind can run riot when the music blares in the dark…. 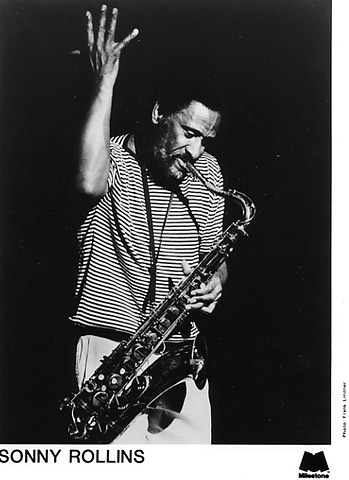 This entry was posted in Jazz and tagged Sonny Rollins. Bookmark the permalink.